It’s that time of year again to dehydrate onions. The onions that were stored last fall are beginning to get soft and sprout letting me know that my least favourite job is upon me. The reason it’s my least favourite job is because I’m allergic to onions. It’s not just that my eyes water, but my whole face runs. I sneeze, my nose becomes red and the attraction factor goes out the door. On the other hand, I love onions. I grow them, store them, use them all winter and what is left I dehydrate in the spring or freeze. Freezing is great if you don’t have time to dehydrate them, but I have found that even if I put the onions in multiple bags, then in a plastic container and anything else I can think of, my freezer always smells like onions whenever I open it. So, for me, dehydrating onions works the best and takes up the least amount of room. When I go to use them I just soak them and then use as normal or put them dried right into the soup or stew. They are also great on the top of meats or salads or… but I’m getting ahead of myself. Here is my method for dehydrating onions. Pull all the onions out of the storage cupboard and bring into the kitchen. Sorry, didn’t take a picture. Then I go through them all, peeling and cutting away the soft spots and throw them into the compost. Keeping the good ones, I then cut them into 1/4 inch slices and chop them with the Vivdalia chop wizard. Another tool I can’t live without. I will put a link to all the equipment I use at the end of this article. Some people cut the onions into slices and dehydrate them that way, but normally if I’m going to use an onion, I use it chopped, so that is how I dehydrate them. Once the onions are all chopped, I then clean everything, and I mean everything. At this point in time, the house will be overpowered with the smell of onions even with the windows open. All the utensils and cutting boards head into the sink and I put a cloth over the chopped onions while I’m doing the dishes and prepping the dehydrator. I dehydrate outside. I don’t like the smell or the noise of food dehydrating, so I have a spot on the front porch that works great. Might take a little longer in humid weather, but well worth it. Because I dehydrate a lot, I’ve purchased extra trays and the screens. They stop smaller food like the chopped onions from falling through the cracks. My screens have gotten warped over time, but they still seem to do the job and are easy to clean in the sink. A lot of people claim that you shouldn’t have the food touch on the tray and leave a lot of space between items. I just put it on the tray, not too thick but covering it and it seems to work fine. Again… it might take a little longer to dry using this method. Once I have all the trays full I take them outside and put them on the dehydrator. Set it at 125 degrees Fahrenheit and leave it overnight. The next morning things are usually dry, but as the onions were fairly juicy when I put them in, I left them for another hour until I had time to get around to dealing with them. To process them, I use the following equipment. A cookie sheet from the dollar store, mason jars, funnel and an oxygen absorber. I bring in the finished trays, take off the screen and place it upside down on the cookie sheet. Then I just bend the screen and move it around, brushing it occasionally with my hand as the onions fall off. Once I have as much off as possible, I will even fold the screens over and rub the two halves together and last of all, turn it over and pick off any remaining onions. Rob likes them fresh right off the screen. They are like the crunchy onions bits you can buy at Costco and he can eat a whole onion without even realising it in a handful. Now that I have emptied the trays and have a pile of dehydrated onions, I will start to fill a jar. I just put the funnel in a wide mouth mason and fill it up to the top. 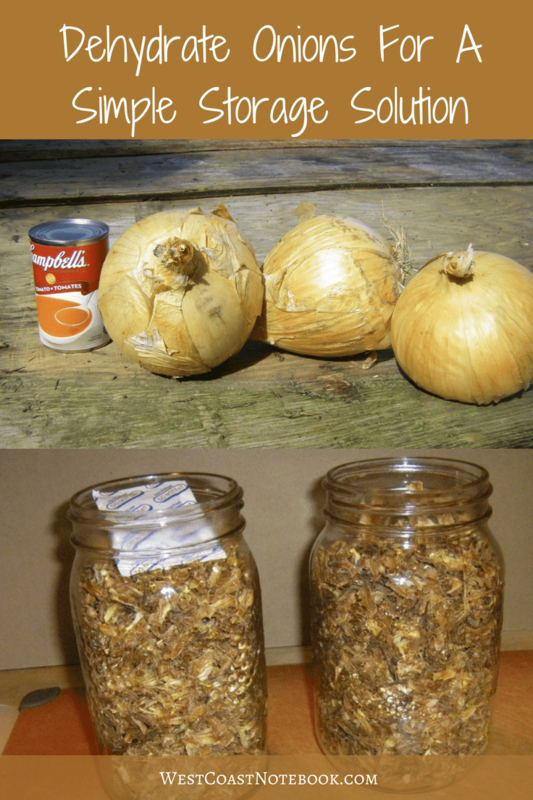 A number of onions that were processed created two 1 quart jars. To seal them, I just put in an oxygen absorber and close the lid tight. As I’m just about out of oxygen absorbers, and I think I might buy a jar sealing kit for my food saver. These onions last for years as long as there is no moisture left in them. Any anything else you can think of. Today I decided to do up a video for you.